I recently participated in Peter Senge's Society for Organizational Learning's (SoL) Global Conference on Bridging the Gulf in Muscat, Oman. The 400 participants were from 48 countries around the world, with native English speakers being in the minority. My presentation on Building Connective Organizational Cultures was well received, and SoL published my article on the topic in their proceedings. Presenters were asked to design interactive learning stations in what conference planners had envisioned as a "Learning Souq." 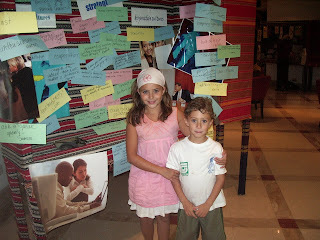 Below is a photo of some young visitors to my souq, where I asked participants to describe the characteristics of connective and disjunctive cultures they've experienced, then identify strategies that help organizations build more connective cultures. I've asked these same questions of nonprofit, government, and corporate leaders in Asia, Africa, Europe, North and South America--and have observed the same results as the answers provided by souq participants; there are universal understandings of what makes a healthy and an unhealthy organization--and every individual has experienced both! Some of the traits participants said were hallmarks of healthy, connective cultures include: People are valued--their work makes a difference, common purpose, acceptance, clear goals, able to speak openly, enthusiasm, and peaceful respect of diversity. Traits participants identified as linked to disjunctive cultures are: Competing agendas, provincial arrogance, not listening, playing favorites, clash of cultures, lack of trust, insecurity, lack of unity and jealousy, accusing others, unclear goals. Some of the strategies mentioned to help organizations build connective cultures include: Create a safe environment, make sure people know their roles, accountability that is fair, clear, and self-determined, surface unspeakable/unspoken, be intentional in designing structures and systems, reward behaviors you want to nourish, build a shared vision, involve people in decisions affecting them, develop and practice shared operating agreements, listen for understanding--withhold judgment, leaders model behaviors desired. To see some of the dynamic conference keynote presentations, like that of Professor Mohammed Yunnis who was awarded the Nobel Prize for his work in Pakistan in microeconomic support of women entrepreneurs, you can log into SoL's website, www.solonline.org. 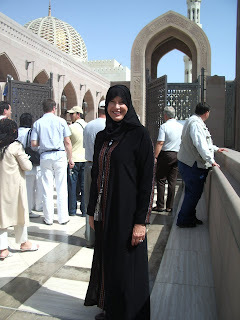 I was absolutely charmed by the Omani people, who are warm, generous, friendly, and open. The country is beautiful, with unspoiled, sweeping white sand beaches, deserts, amazing architecture, and delicious cuisine. BTW, that's me in the top photo at the Great Mosque. An American who was touring the mosque asked me what the Arabic inscriptions on the arch behind me say, and when I told him, he complimented me on how well I spoke English!